Charles Ritchie after Bill Viola, graphite on Arches paper in bound volume, 4 x 6″. 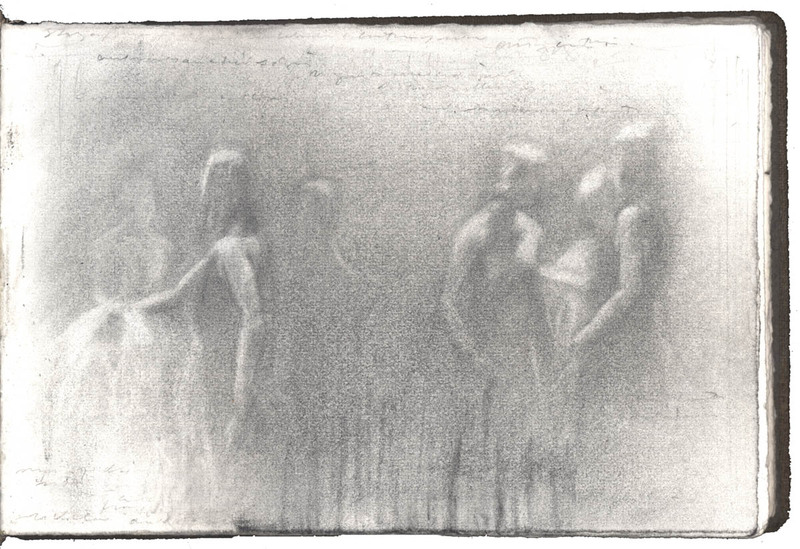 Sketch made from two photographic stills by Kira Perov from Three Women, a video project by Bill Viola. Perhaps the artist working today I most admire is Bill Viola. I was deeply moved by Viola’s retrospective exhibition at the Whitney Museum in 1998. While the artist’s installation/video projects often merge sophisticated devices such as high definition plasma screens and elaborately programmed projections, lighting, and audio; his art comes from the heart. I heard Viola speak at the Smithsonian Art Museum a week or so ago. As he stepped to the podium his notes spilled over the stage. He quipped he had five hours worth of talk with him; considering all the paper, I believe him. He kept it to an hour and twenty minutes (thankfully). And although I wish he had talked more about specific works and his experiences making the pieces, I was riveted to what he was saying. Viola speaks from the deeply spiritual place his work emanates. Viola’s presentation ended with a projected video entitled Three Women, one of his works I have not seen before. It broke my heart. The video opens to a gray curtain, subtly shifting. One senses fog being recorded on grainy film. Eventually three figures emerge, walking in slow motion towards the viewer. It becomes apparent we are watching a mother and two daughters. Suddenly the mother breaks through the curtain with a splash and into a world of color. The viewer realizes the thin veil is an evenly flowing waterfall. The two daughters follow the mother through the falls one by one. Each looks around and then they step back through the falls again. Turning away and fading back into the gray curtain. Who are we? Where are we? Where are we going? The biggest questions there are. Viola rethinks them. And while my own journals, drawings, and prints follow a different program, I look to Bill Viola’s work as a model for the depths and spirit that art can contain in this often muddled and anti-spiritual contemporary life.